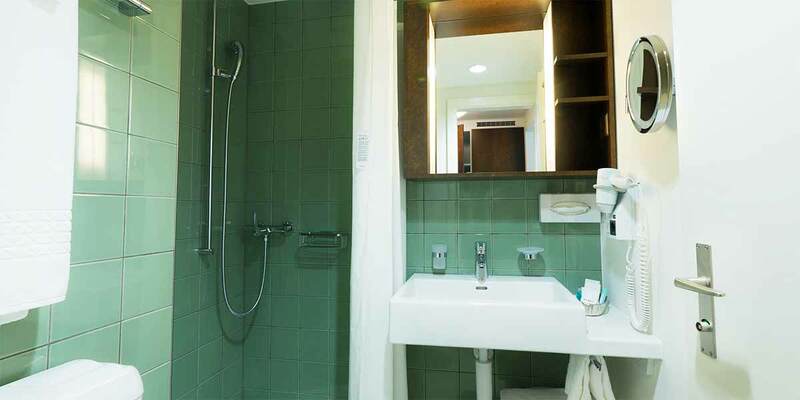 All the COMFORT rooms have been newly refurbished to the newest standard of a good middleclass Business Hotel. All our rooms are equipped with soundproof windows, digital TV/Radio, free internet access, a fridge with a free ‘Welcome drink’, a desk, a chair, an armchair and a big mirror. A generous continental breakfast buffet, which will certainly fulfill all your wishes, is available for you every day from 6-9am. Also people with allergies are very welcome. We tried to furnish the room as nice and comfortable as possible. You’ll find furniture of high quality as well as tasteful paintings made by artists. And all this in 15-17 square metres. A modern, generously designed bathroom with shower and many extras. The beds are big and of the highest standard with BICO mattresses. Each single bed measures 210x120cm. Every room is equipped with a new digital flat screen TV. All COMFORT rooms even offer an extended TV programme by UPC. Free Wifi by Swisscom available in every room. Landline telephone. You can be called directly from outside. There is a safe in every COMFORT room to keep your valuables safe. To be operated with your own code. Electrically operated blinds darken your room. There is a sound-optimized parquet in the living room area.